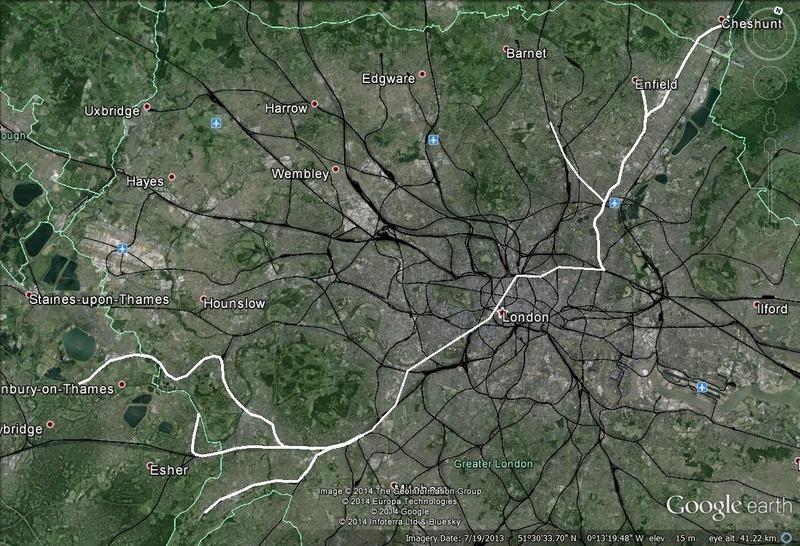 Trans-trax: London´s Cross City rail lines, and more. London´s Cross City rail lines, and more. The last few weeks has seen some movement about the extension of rail services across London. It all started with "London First´s" attempt to promote a cross London line from the South West to the North East of the City. This they have called Crossrail 2 which is really a misnomer since it mixes concepts even though most of the idea might well be positive. We will look at this later in a clearer context. It would be better to look at why these ideas about cross London rail connections are now flourishing. From that we can see why these ideas should be focused and what such focussing can provide us with. Let us begin with why there is a desire to provide cross London Rail services. The London Underground lines (LUL) go across town over a network developed over 150 years. There was no great plan and so we have what we have. We can live with this network, or fix it, or develop it inside or outside the limitations it has given us. The National Rail network developed for differing reasons, mostly providing (what came to be known as)regional and inter-city services. The exceptions here were the commuter services (pricinpally south of the Thames) mixed in with the other services. Basically these were provided where there was a lack of LUL services. From 1948 British Railways became the nationalised body in the UK to run the railways. In the south-east these were still grouped around the four original companies (which became the regions) of Western, London Midland, North Eastern and Southern. Much later the regional and commuter services were organised into Network South East. Thereafter, from the 1980s and 1990s the government policy was of privatisation of the transport system which resulted, after several ups and downs, into the system we know today in 2014. Faced with an upsurge in demand for rail services, which have not seen such passenger demand since the 1920s, based on experiences in the last ten years together with forecasts of a growing population for London of 1.000.000 over the next 15-20 years, it is then obvious to see that pressures on the transport system are going to be tremendous. Obviously, a lot can be done but we have to be rational and work within reasonable parameters and manageable resourses. a)-more trains with greater frequency - this is the result of better operational use, reducing the interval between trains -- it comes down to improved signalling. b)-longer trains -- this is heavily dependent of the length of platforms at each station. Extension is possible but limitations apply. http://www.globalrailnews.com/2013/09/03/s-stock-trains-take-to-circle-line/ and will be done on other lines. After that we come to basic operational details. Any train stopping at a platform on a through station will remain to offload and load its passengers in a short time. These permit the train to enter and exit the station in an extremely short period so that it can be on its way in, even, under one minute. That permits the time difference between trains on lines through London being in the region of two-three minutes at rush hours. At least the north-south Thameslink through Farringdon and Blackfriars, as well as Crossrail aim to offer 24 trains per hour in each direction. That is fine for through stations but when it comes to termini the situation changes. The Thames Valley commuting trains into Paddington and the commuter trains into Liverpool Street are the ones which will provide the traffic for Crossrail when it comes into service in 2018. These trains, at present, arrive at each terminus and stay for far longer than two-three minutes. They occupy space and time at each terminus. This is where time can be saved and frequency increased by putting them on to Crossrail. Eliminating these commuter services from the termini permits greater use of the platform space for more regional and long distance trains. This is where great gains can be made. The introduction of Crossrail in 2018 is estimated to provide an increase in total London commuter capacity of 10% - a substantial increase. Having understood this we can then look at the problem of commuter services entering and terminating at mainline stations in London and how they can be taken out of the termini to provide services through Central London. A second problem raises its head, however. Almost all the commuter services are run with electric traction. All London Underground(LUL) and almost all London Overground(LOL) services are run on the three rail system - drawing electric current for traction from a third rail. The old Southern Region of British Rail - basically all the services south of the Thames - also uses the third rail for electric traction. These services these days are offered by, mostly, South West Trains, Southern and Southeastern. North of the Thames most services are electric but using overhead wires for collection of the current. This is true for commuter services out of Paddington, Euston, St.Pancras, Kings Cross, Moorgate, Liverpool St. and Fenchurch St. The exception here are the Chiltern Trains services out of Marylebone. At the moment they are run with diesels so it is not a question of if, but when these lines are electrified they will be to overhead electric transmission. From that if we wish to link commuter services to commuter services, as will be done with Crossrail, then we have to think of compatibility and cost. This brings us to the conclusion of "like with like", as much as possible. Thameslink is the exception since it operates both north and south of the Thames. This is not an ideal solution because the trains which travel to both sides of the river have to be compatible with both systems,third rail and overhead, resulting in more complex and more expensive vehicles.However, a lot can be done with thought. 1)- Crossrail A: I do not wish to use numbers since they could lead to confusion about what I want to say. For that reason the original Crossrail I will call Crossrail A. This is the line which runs from Reading and Heathrow Airport in the west to Shenfield and Abbey Wood in the east. It involves electrification of quite a part of the line with some new construction down to Abbey Wood and tunnels through Central London which are about 21kms in length each way. In the east there has been speculation about extending the line from Abbey Wood to connect to HS1 at Ebbsfleet - a logical and inevitable event. From Shenfield the extension can be made from there to Southminster and Southend Victoria taking over the said part of the Greater Anglia services into Liverpool St. In the west we find that 14 of the 24 trains per hour will stop at Paddington. To rectify this misuse of resources there has been a proposal to feed on to Crossrail some of the commuter services from Tring, or even from Milton Keynes, that presently run into Euston(London Midland services) from the WCML. To this blogger that sounds like a badly thought out quick-fix.Thus I offer an alternative. The Great Western services between West Ealing and Greenford are intended to be run as a diesel shuttle service. 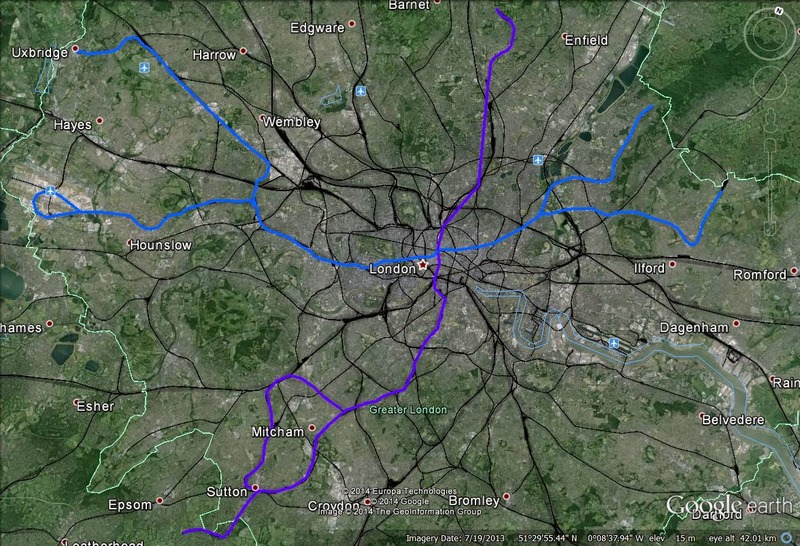 This blogger proposes that Crossrail A services run along that line to Greenford and on to West Ruislip.They would thus take over the LUL Central Line services to West Ruislip so that the Central line would terminate at Greenford.This would entail lengthening of the platforms at each station and conversion of the system to overhead electric wires. This will not seem such a wild idea when I mention Crossrail B. The interchange at West Ruislip would be between Crossrail A , Chiltern Line trains and even HS2. 2)- Crossrail B: If we take it as a logical progression from policies applied north of the Thames regarding electrification of rail services, then it is safe to say that when electrification comes to the Chiltern Lines from Marylebone station then they will be converted to overhead operation. From that we can associate the Chiltern Line commuter services from Marylebone with existing commuter services to Amersham and Aylesbury Vale Parkway plus those to High Wycombe and Aylesbury, plus the London Midland services to Tring and Milton Keynes along the WCML. These run roughly parallel so are complementary. At the other end of central London we have the Essex Thameside line operated by C2C from Fenchurch St. The London Midland and the C2C services (and it is supposed the Chiltern services eventually) are operated by overhead electrical supply. Join the two sides with a tunnel from Fenchurch St. - Cannon St. - Blackfriars - Aldwych (more to be said later) - Tottenham Court Rd.- New Cavendish St./Portland Place(new station) - Marylebone (and Baker St.). From Marylebone one branch would continue to South Hampstead and West Hampstead to continue on the Chiltern Lines to the north west, while a second branch would connect Marylebone with Queens Park and on to the WCML out to Watford Junction etc. The lines at both ends would need no special conversion as they are overhead wires. The inevitable electrification of the Chiltern lines would be brought forward but that is only a question of when not if. The tunneling from Fenchurch St. to Marylebone and onwards would come to about 13.3kms. which compares quite favourably with Crossrail A where the tunneling has come to be about 21kms. in each direction. Are the services compatible? If we look at the periods of 06.30 to 10.00hrs for those services into the London termini, and from the termini between 16.30 and 20.00hrs. we can see that C2C runs 48/49 into and out of Fenchurch St. while London Midland (into / out of Euston) plus Chiltern Trains (into / out of Marylebone) run in total the same number of services - 48/49. That makes for a rate of 14 tph at each end. However, if we understand that joining the lines would mean there were no platform dwelling time at the termini we can see that a capacity increase is built into the system ready to be exploited. One line which could be used, at least in part, is the now closed Post Office Railway which runs from Paddington to Whitechapel. This would save a large amount of expense on tunelling. As a result a valuable piece of real estate at Fenchurch St. would be freed up for development to help pay for the scheme. 3)- Because of this solution we are now presented with an opportunity. The Metropolitan lines from Amersham, Chesham, Watford Junction (soon to be completed) and Uxbridge run into Baker St. for most of the day. At the rush hours these trains run along the Circle Line to Aldgate to serve commuters into/out of the City. The potential of this line is, therefore, underused. With the "Crossrail B" services running across town to serve the City and onwards The Metropolitan Line does not need to serve the City but can be put to other uses. An overlooked gap in the central London LUL map now has the opportunity to be filled. The Metropolitan line can now run Baker St. - Marble Arch - Hyde Park Corner - Victoria - Kennington. From there it would continue south to - John Ruskin St.(new station) - Camberwell New Rd. (new station) - Denmark Hill - North Dulwich - West Dulwich - Sydenham Hill - Gipsy Hill - Crystal Palace. One line would then branch off to Beckenham Junction while the other would go to Purley then divide to Tattenham Corner and Caterham. These inner London services would thus pass to TfL following the policies of London´s mayor that all such services should be under TfL. 4)- Once we look at the Metropolitan Line services from the north west suburbs then we have to look at the LUL Bakerloo Line. This, at present, runs from Harrow & Wealdstone to the Elephant & Castle, south of Waterloo.Any extension northwards of this line would be up to Watford Junction coinciding on that section with the services into Euston of Overground. However, there is a proposal on the table from Transport for London(TfL) to extend this line to underserved areas south of the Thames. "Proposed Bakerloo line extension route considered", (Global Rail News 30-9-14) and (Evening Standard 20-10-14)"Government funds may not be needed for £3bm Bakerloo Line extension,"
There are a couple of things to point out. The southern extension only provides one new station at Camberwell connecting to the existing station at Peckham Rye, while the northern extension to New Cross Gate provides two new stations (provisionally named Old Kent Rd. 1&2) in this underserved area of South London. This blogger thus supports the northern option as being more beneficial especially since a Camberwell station can be built in the Metropolitan Line project. The other point to mention is that there is a reference to an extension to Bromley town centre. This has since proved to be the the extension of the branch through Beckenham Junction to Bromley South. On the other hand there is a branch from Grove Park to Bromley North. This, at the moment, is stuck out on a limb. However, if the previously existing services from Lewisham to Grove Park were reinstated to go along this branch then we have another option for the whole Bakerloo line. It is pointed out that the branch to Hayes would take over all the National Rail services along that line. Any extension to Bromley South might take over, at least, some of the services from Victoria to Orpington. That, however, has to be explained in more detail. The Bromley North branch runs 3 tph thoughout the day. To provide a metro service a minimum of 4 tph is considered necessary. With a Bakerloo branch running through Lewisham direct to Bromley North that is quite feasible , if train paths are available. On the other hand there exists the idea of extending the services from Beckenham Junction to Shortlands or Bromley South and then with a new section of line to join up to Bromley North and on to Grove Park. These services would substitute the services through Lewisham to Bromley North and , therefore, not then interfer with the mainline ones through Lewisham and Hither Green down to Sevenoaks. 5)- Once we mention any Bakerloo line extension we have to look at the Overground(LOL) service from Watford Junction to Euston. The Overground service is basically a cross London service to circle the capital. This has been the development so far, very successfully. The Overground services terminating into Euston, therefore, have no logic. If we look at the Overground map we can see that there is just a short break between South Hampstead and Camden Rd. The distance is 2.8kms over an already existing line between the two stations but really comes down to a connection of only 800 meters on lines which already exist. It does not suppose any new construction so can be accomodated very easily. From there the Watford line can be connected, in two stops, to the line at Highbury & Islington from which services can be forwarded on to New Cross, Crystal Palace, West Croydon, and Clapham Junction without any difficulty. 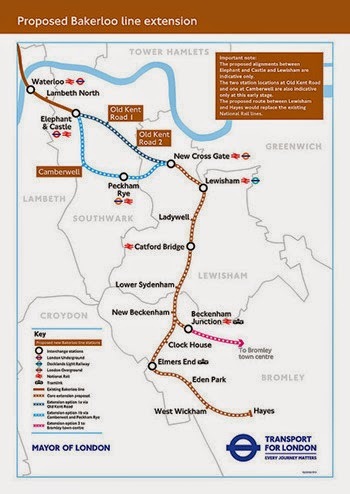 There was a proposal to extend the Overground services from New Cross southwards to Lewisham. This is only possible with works at New Cross. Where the present lines diverges from Surrey Quays to New Cross it becomes a one way line which then runs into New Cross without any connection to the other lines through the station, into a turnback facility with one platform. Substantial works would be necessary to be able to extend the line southwards to Lewisham which are most likely not cost effective. For that reason the Overground services from Watford Junction could run into New Cross,into New Cross Gate and on to West Croydon, Crystal Palace and Clapham Junction as the present services do. These Overground services from Watford Junction, being diverted along the line through Camden Road and Highbury & Islington will only mean the loss of Euston as a station. That is beneficial as it will free up much needed platform space and can be easily covered by the services on the Bakerloo line plus the improved services on Crossrail B. The Piccadilly (LUL) Line runs from Heathrow and Uxbridge to Cockfosters. From the west after Leicester Square and Covent Garden the line turns north to Holborn, Kings Cross, Finsbury Park and Cockfosters. However, from Holborn, there still exists a branch(now closed) to Aldwych (closed). If there were a will then the Cockfosters branch could run south to Holborn, then Aldwych and southwards under the Thames. The logical extension would be to Temple (Circle/District lines) - Waterloo/Waterloo East - Elephant & Castle - Camberwell(a new station as indicated before) - Loughborough Junction - (and stations to) - Tulse Hill - Streatham Common - Mitcham Junction - Sutton and Epsom Downs. Obviously this line would include the loop through Tooting, Wimbledon and Sutton (at present operated by Thameslink). 7-) With this operation the Piccadilly Line would be truncated at Holborn. However, other proposals in the past (like the abandoned Fleet Line project) have looked at the idea of aleviating the crowded Central Line. This has meant, for example, taking over the Central Line services from Leytonstone to Gants Hill and Hainault. If we extend this Piccadilly line services through Leyton Midland Rd. - Hackney Central, it can connect to the Chingford Line services through St. James Street to Hackney Central. The Line could then go south through (e.g.) London Fields - Haggerston - Essex Rd. - Angel - Clerkenwell(new station) to Holborn and onwards.That way we would have the Central Line aleviated while the Chingford Line, which will be taken over in 2015 by Overground, giving up its terminus and platforms at Liverpool St. while obtaining useful cross-London destinations. Tunelling would be needed from Holborn to Hackney Central which is about 6.4kms each way. Add to this tunelling from Hackney Central to below St.James St and Leyton Midland Rd. which could come in total to 6.2kms. each way. The service to Chingford would need to be changed to the third rail system but that to Hainault would need no change. This is how the map would look like with these two lines. That leaves the "London First" proposal for the so-called Crossrail 2 project. It is also known as the Chelsea- Hackney line, or in short the Chelney Line. That is how I prefer to refer to it as will be seen. The new line, Crossrail 2, would transform journeysfor commuters from the south-west and the north-east, including Wimbledon, Kingston, Hackney, Islington, Tottenham, Cheshunt and Hertford East. It would also provide essential relief to major London interchanges, including Euston, Victoria and Clapham Junction, and reduce pressure on congested Tube lines. In some cases, journey times would be more than halved. The Mayor of London, Boris Johnson, presented on 29th October his plans for this route. The general direction of the line has been laid down for some years. At first it was a southwest - northeast line to cover areas, such as Chelsea and Hackney which were lacking in Underground coverage. Now, however, we have to be more specific. 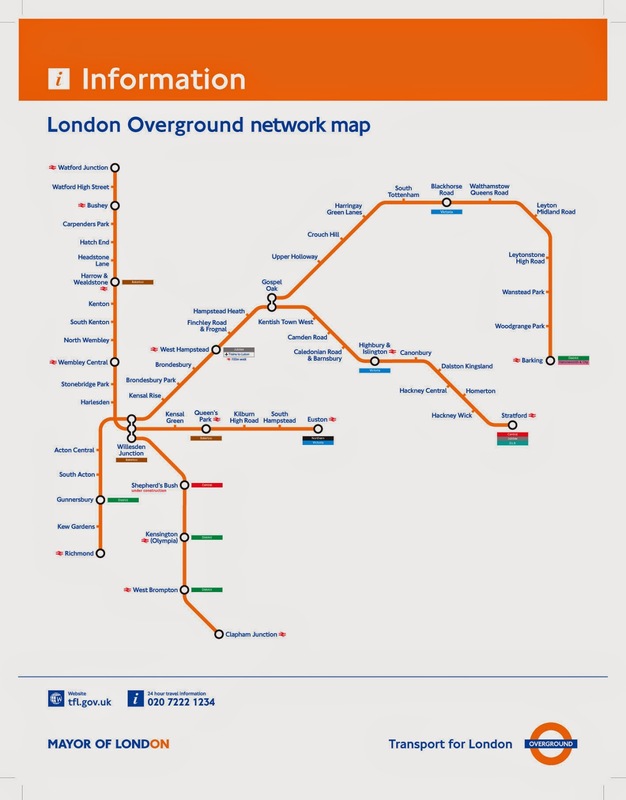 i)- The Greater Anglia lines from Cheshunt and Enfield through Seven Sisters are to be taken over by London Overground, together with the services from Chingford, into Liverpool St. in 2015. These services can be taken out from Liverpool St., thus freeing up platforms, and fed under the City to form part of the Chelney Line. ii)- I disagree with London First in that these lines should go through Tottenham Hale. I would prefer to send out the Greater Anglia services from Liverpool St. to Hertford East, Stansted and Cambridge through Stratford. The Stansted Express as well as other local stopping services can call at Stratford to provide the necessary connections. By not calling at Tottenham Hale the Victoria line will not have the connections envisaged and so will not be provided with transfer passengers to an already overcrowded line, these will then be funelled on to the Circle Line. iii)-The extension to Alexandra Palace and even New Southgate can be taken on from London First´s suggestion, however, I would run the line from Seven Sisters.That way the inner core could have greater frequencies of trains while reducing the construction costs. 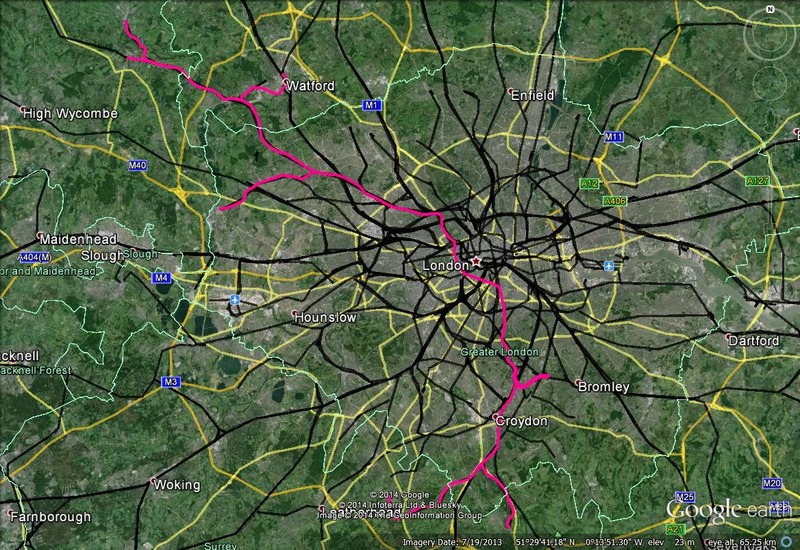 iv)-In the inner core the number of stations and their location can be taken from London First´s plan. However, north from Kings Cross this blogger suggests stations at Essex Rd., Haggerston, London Fields to connect to Hackney Central. v)-At the southern end of the line there would be branches to Shepperton, Hampton Court and Chessington South. These would take over the South West Trains lines to those destinations thus freeing up platform space at Waterloo. vi)-There is a suggestion to run a service through Kingston, Teddington, Strawberry Hill to Twickenham. That, however, has its difficulties as a new flyover would have to be constructed at Twickenham into a turnback facility which does not exist - certainly an expensive option. vii)-There is also a suggestion to run trains from Wimbledon and Raynes Park through Motspur Park and Stoneleigh to Epsom. The practicality of this would depend on other services from Victoria and Waterloo to outlying areas. capacity so as to satisfy the demands to made upon it it in the latter part of the 21st Century. To read more on this subject look at the blog of London Reconnections for 24th October 2014.